On December 11 and 12, it's alleged, a chemical attack from the air, in ISIS-held Hama province, killed at least 30 and perhaps nearly 100 people, according to activists linked to the Islamic State (ISIS) and the Syrian Observatory for Human Rights. The agent was allegedly sarin nerve agent, which hadn't been alleged to be used on such a scale since 2013. According to ISIS sources, the attacking jets were Russian. Human Rights Watch and others eventually weighed in on these allegations, with blame settling more on Syrian forces. Location, given as near Uqrabiyat, is not very close to Palmyra or related to any direct efforts to reclaim it; Located 90 km NW of Palmyra, closer to Homs (30 km east of Salamiya, here on Wikimapia) More specifically, the VDc cites Jrouh village (Arabic: جروح ). locaion: E-NE of Salamiyah, 7 km NE of Uqrabiyat (here). It's well within ISIS-held territory as of 28 June 2016 and still in December, by reports. The Local Coordinating Committees also report (Yalla Souriya) 86 martyrs killed by the bombing with Sarin gas on the eastern suburb villages #Grouh (Jrouh) #Alsalaliey (just south) and #Hamadi_omar (a bit further to the southwest). The hub town of Uqrabiyat between them was apparently spared. A total of three alleged strikes makes the large and divergent death tolls a little more plausible. SOHR English: first 26 killed in various raids, including some chemicals, then 53 killed "in bombardment by warplanes using rockets carrying toxic gases which targeted Uqayribat area and the nearby villages in the eastern countryside of Hama,"
BBC: Palmyra: 'Chemical gas attack' hits IS-held Syrian area. 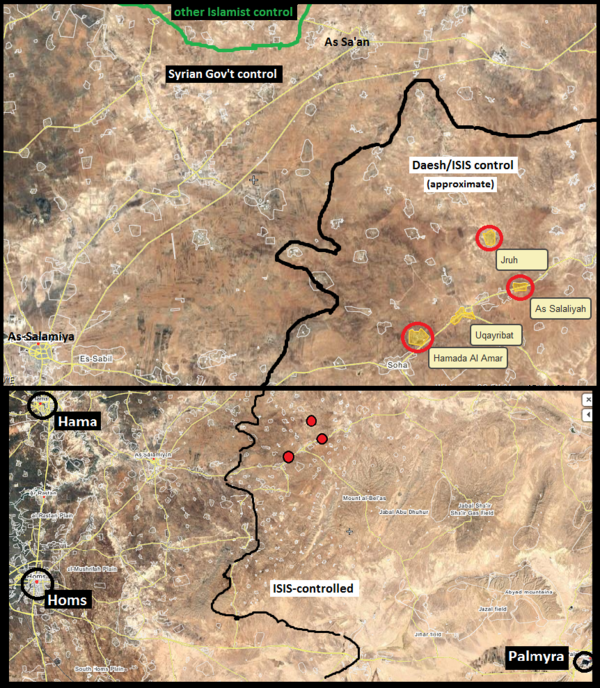 "Citing local sources near the site of the attack ... (SOHR) said there were cases of suffocation and that dozens had been wounded during heavy rocket fire on the area. The dead included 28 children, the Observatory said. The reported attack came from the air ...the Observatory said, without specifying who might have been responsible. Amaq, a news service linked to Islamic State, said in an online statement that 20 people had died and around 200 were injured from breathing problems "as a result of a Russian air attack with sarin gas". Ahmad al-Dbis, of the Union of Medical Care and Relief Organizations (UOSSM), said about 86 people had died, and about 250 were injured in the attacks on Monday. ... Photographs purportedly taken after the attacks show rows of children lying on the ground. All appear to be dead and foam is apparent near the nose of one young boy. The OPCW expresses concern over the reports. Yalla Souriya 85 killed and 500 civilians injured most of them are women and children, by regime Sarin gaz attack on Uqayrabat area" There's no further explanation, but photos of 5 dead children, from babies to preteen. One apparent girl has foam bubbles from her nose and clenched fists. VDC only lists 34 people killed, and all from Hama, Jrouh village, "Due to the shelling with Sarin gas," blamed on "Russian Troops." The others apparently haven't been documented yet, but if they were on par, we'd be expecting the 80-93 or so that's been claimed. Of the 34, 33 died right away on the 12th, and one man 3 days later. This sub-total is not "mostly women and children," but perhaps the other town's tolls balance it out. 6 women, 2 girls, 5 boys, and 21 men (22 appear but one is a "wife of"). This could be one complete family, another 3-5 husband-wife pairs, and around 16-18 men without their families. At least 12 victims are from a Hasan family, and a few other names repeat. The area is ISIS-controlled: "The Dawood Brigade, which controls the area, declared its allegiance to ISIS in December 2013." There were two attacks reported,killing a reported 67 between them (Jrough Dec. 11, 25 dead - Al-Salaliyah Dec. 12, 42 dead). Both attacks were at about 7-7:30 am. No Hamada Omar attack is mentioned. "The explosion from the first munition was loud and created black smoke, while the explosion from the second, about 10 minutes later, was more subdued. He said he drove to the second impact site, which was near caves where people from the village had sought shelter from the attacks: “I entered one of the caves. There were about 20 people in it. A lot of them were unconscious, some vomited, and they were weak. Most of them were women and children. Some of the injured completely lost their sight after the attack.” “Abu Ali” said that the attack killed 42 people in al-Salaliyah due to chemical exposure. Most of the people who died had been hiding in two caves." symptoms include breathing difficulties, red eyes or swollen etes and vision problems, headache, lack of coordination, vomiting, swollen face, coughing blood, and dilated pupils (sarin causes the opposite), as well as constricted pupils (HRW notes the conflict), unconsciousness, convulsions, "hysteria." This is peculiar and could mean it was impure sarin or similar, as used in Khan al-Assal and other sarin attacks, with its unpleaesant smell and usually yellowish color. But since sarin is supposed to be colorless and odorless, some might decide to describe it that way while others describe it how it was. This page was last edited on 30 September 2017, at 09:49.